Whilst the annual golf classic has been a constant in Shannon Chamber’s annual calendar of events and is eagerly awaited each year, members savoured an addition to the social events’ schedule last week when they played a mini competition and had their golfing assessed at Dromoland Castle Golf Course. 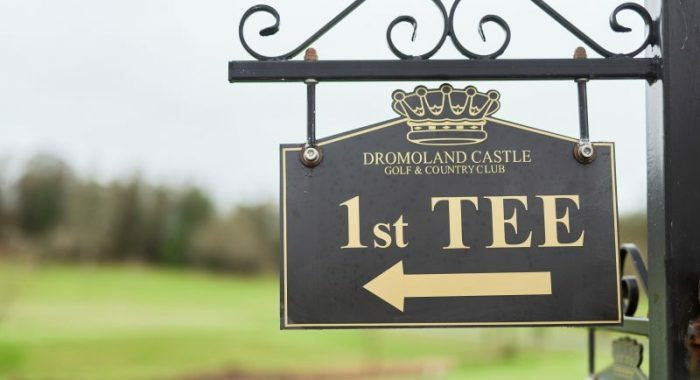 The event, which was organised by Carr Golf on behalf of Dromoland Castle, saw 5 teams, each comprising 3 Chamber members led by a member of the Dromoland team, test their skills around 5 holes, putting the tuition they received from Connaught Golf’s Ian Kearney into practice. Course superintendent and Ennis native Paul Coleman outlined the work that has been done on the course over the past twelve months: “To assist in keeping the fairways and green surrounds dry throughout the year, we apply approximately 800 tonnes of sand annually to supplement the drainage system. We recently purchased a fleet of new golf buggies as well as two 6-seater guest transfer vehicles. The state-of the-art buggies are the most modern in Ireland and are all equipped with the latest Visage GPS technology, which not only improves the overall golf experience but also allows us to monitor and control where the buggies are driven. “Last year, we invested over €600K into the course. Approximately 7km of tarmacadam pathways were laid right the way around the course and we replaced the course furniture: bins, ball washers, tee markers and yardage markers etc. The golf academy, which was opened in 2006, includes 9 automated driving bays (8 right and 1 left handed), 2 x 500 sq. meter grass teeing areas, teaching room and a short-game area comprising of 2 x 500 sq. meter greens for putting and chipping. The driving area is lit up at night time by a unique lighting system produced by Abacus Lighting. It delivers a much less harsh light that faces away from the golfer but allows him/her to follow their golf ball all the way. We also have a links’ style pot bunker, modelled on the famous road hole bunker at St. Andrews Links.